Sorry again for a week in between posts. It was one of those weeks that just flew by. I’ve been busy and happy and more than a little bit tired (the Olympics threw off my sleep schedule badly). Anyway, I’ve been having a lot of fun working on my youtube channel and movie blog. I am almost at 1,000 subscribers so if you aren’t subscribed help me out! 🙂 I have particularly enjoyed doing podcasts with friends. My friend Tom and I are almost finished reviewing all the Star Trek movies (that’s 13). The last one will be this week. I also posted my Disney Canon video of Hunchback of Notre Dame and my friend Christine felt really differently. We did a podcast and talked about our differences. I’m really proud of it and how it came out. It shows to the internet you can disagree without being disagreeable. On non-youtube front there has been lots of stuff going on. The biggest news is my parents have officially moved to Utah. There was definitely a time when this would have annoyed me, having my parents so close. But now I’m actually really excited about it. It’s nice to have them close by so I can drop by and visit and have support when I need it. I’ve also enjoyed being close to Sam and Madeline my siblings who will now be living close to me. I went to movie screenings with both of them last week (went with Madeline to Kubo and the Two Strings– fabulous. And Sam to Morgan– not good). I’m really excited for the years to come and having all of that family support! I also went to my blogger book club last week where we read the graphic novel One Dead Spy which was very charming history book for kids. Then yesterday I had 4 of my friends over for my smaller book club where we talked about The Martian. The ladies all seemed to like it even if it did have a little more bad language than they are used too. It was so much fun because I had freeze dried ice cream and tang for the treats! Perfect for your astronauts! So that’s what has been going on. I’m very busy at work creating a game day campaign and my channel and blogging takes up most of my free time but I love doing what I’m doing. Also if you have any ideas for a regular series I could do on this blog let me know. I was doing the Teaser Tuesday book reviews but they didn’t seem to get much attention, so I stopped. I could review books or music. Something simple I could do each week. Billy Joel- Seen the Lights Out on Broadway. This song is from his Turnstiles album which is probably best known for New York State of Mind but I love this unique power ballad. Billy Joel wrote the song about New York City as it was falling apart at that time and close to default and disaster. Richard Marx- Turn Off the Night- This song is from his Beautiful Goodbye album which isn’t that popular but the reason I picked it is because he sang it at a concert I attended just after he wrote it. He described the emotions he had just gone through and asked us if we would like to hear the song and we cheered. It felt like a real authentic moment. After on twitter I told him how meaningful it was and he said he was blown away by it. To me that is a true deep cut. Sure his other songs may be more famous but this is one I got to see why it meant so much. Beatles- Wait. This song is from the Rubber Soul album which is so great a song as good as Wait gets forgotten. I’m Looking Through You or Nowhere Man are probably the most popular off of the album but listen to the entire thing. It’s fantastic. Beach Boys- I Just Wasn’t Made For These Times. Just like Rubber Soul, Pet Sounds, is one of the greatest albums ever released. The harmonies are perfect and every song is carefully written and beautiful. Some of the biggest hits are Wouldn’t it Be Nice or God Only Knows, but I also love I Just Wasn’t Made for These Times because I think we all feel that from time to time. Paul Simon- Silent Eyes. This song is from Still Crazy After All These Years. Quiet songs are always more likely to be forgotten than the more poppy songs, but Silent Eyes is a beautiful song. It’s a song about faith, hope and grief. What are some deep cuts of popular artists that you like? What do you think of my 5 picks? I would love to hear. I’m getting really close to 1,000 subscribers on my channel and would love to cross that threshold so I’d love if you subscribe. Thanks tons! Sorry I haven’t posted this week but I have been in love with watching the Olympics in Rio. I have been in love with the Olympics since I was a little girl- both summer and winter. I used to beg my parents to get cable TV just so we could watch the Olympics every 4 years. There is something about the sacrifice and intensity that inspires me and is like nothing else. Every other competition they have another shot but this is 4 years in the making, which is unbelievable. This Olympics in Rio we have been able to see not just the best win a gold medal but we’ve seen some of the best gold winners ever. 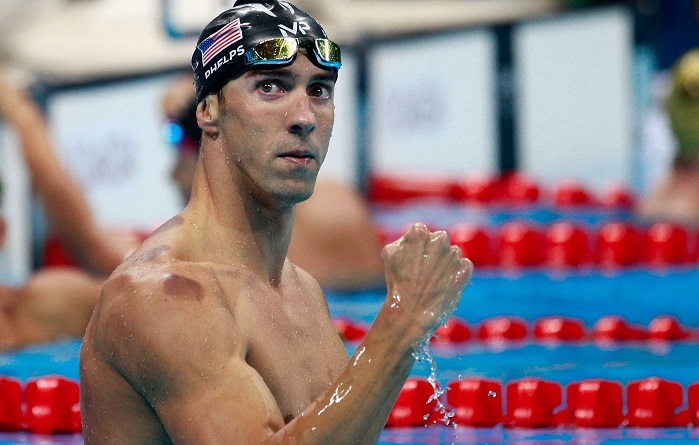 I mean what Michael Phelps has done is awe inspiring. He was already a hero to most Americans but to see him mount a comeback of all things ups the ante even more. His life was off track, he figured things out and then he’s back on top. How inspiring is that? 22 gold medals. I can’t even put my mind around that. Just wow! And then over in gymnastics it has been awe inspiring. Dubbed the Final Five, the ladies not only one the team gold but did it with positivity and team spirit that really impressed me. Simone Biles is so great the other gymnasts are asking her for autographs and shaking her hand. 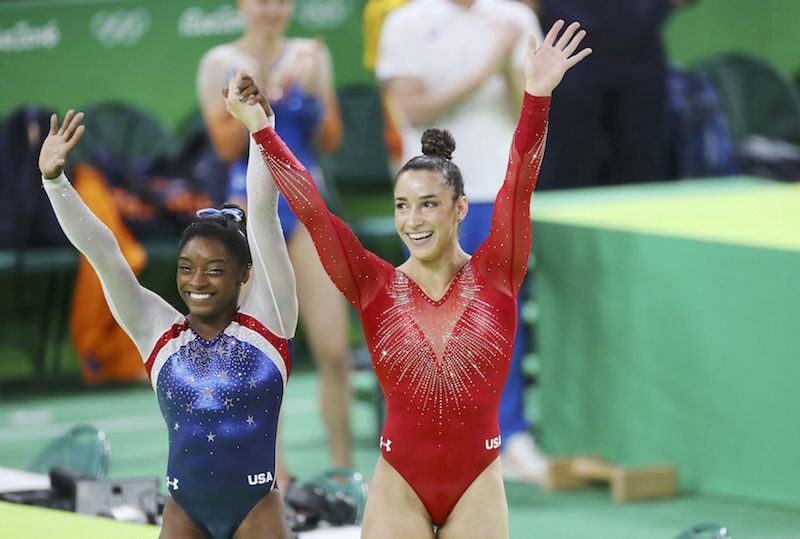 Tonight her and Aly Raisman went gold and silver in the all around and what an amazing achievement. It’s like the judges had to go searching for deductions they were so good. The crazy thing is if the stupid 2 per country rules wasn’t there than we would have probably swept the podium. It’s just been tremendous to watch. The last amazing story I’ve enjoyed watching (along with a million other ones) is Kerri Walsh Jennings over in beach volleyball. The 3 time gold medalist and mother of 2 is looking for gold 4 and whether she ends up with it or not it’s been incredible to watch her play. She has never lost a game in Olympic play and I think only lost 2 sets! That’s just mind blowing. I love the fact that she has used it to help her be a better mother not a distraction. She says she’s good at “having babies and playing volleyball”. Ha! She’s also so gutsy when she had some injuries on her shoulder I believe and yet she keeps going strong. She’s just fearless. She’s at these games with a new partner but seems to be doing well with her as well. It’s nothing short of impressive. What athletes and stories have stuck out in your mind? There are so many so please share in the comments section. And by the way USA is totally rocking it in the medals count!!! Wahoo! Hi! 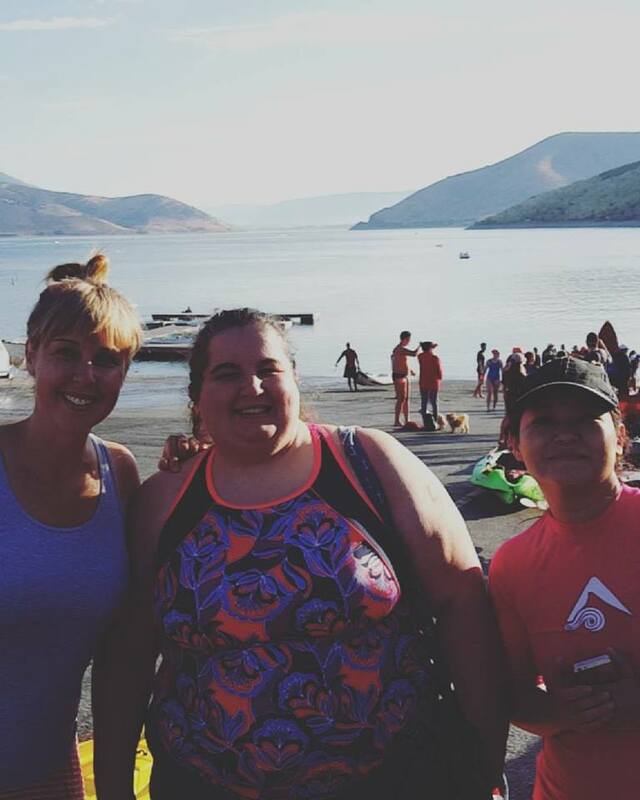 I’m excited to tell you another open water swim is in the books! This is my 11th swim and unfortunately my only race for 2016. I was hoping to get 2 in this year but with my travels it just didn’t work out. Hopefully next year will get a few more in. I will be honest with you I felt a little under-prepared for this race and like I always do I got very nervous this whole week before the race. 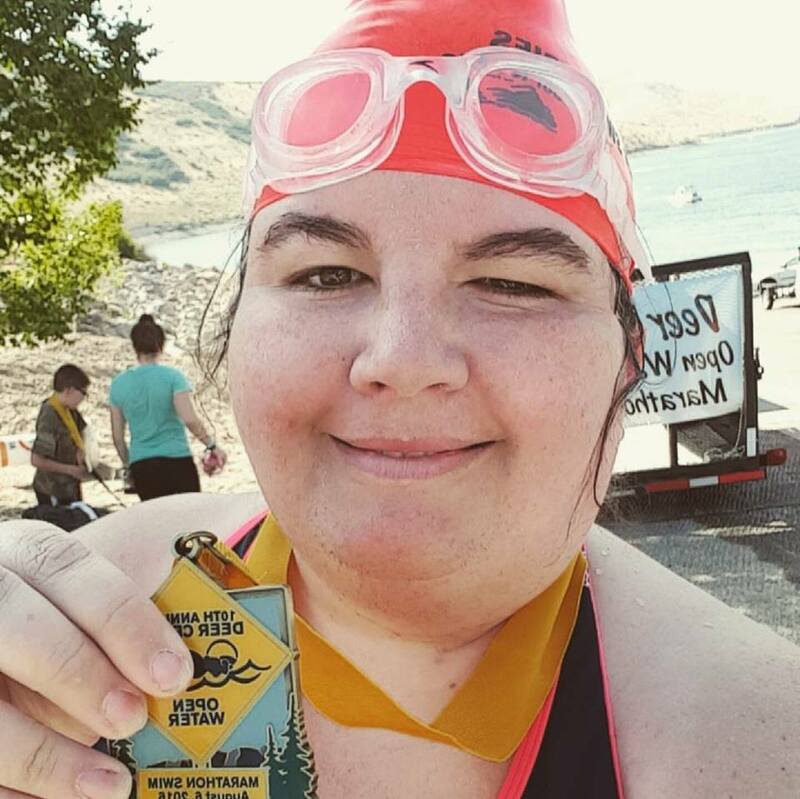 What if this is the swim that I can’t finish? I feel like it is eventually going to happen one of these days but so far it hasn’t. As I got my Dad and drove up to the race I felt nauseous and began to wonder ‘why do I put myself through this?’. Even as I got in the cold water (it seemed colder than last year) I wondered if I could do it. But then I start swimming. I got about a 1/4 mile and I really was doubting my abilities. The 1/2 mile marker seemed like a million miles away. It seemed impossible I would ever get there. But I divided it up into small amounts, 100 strokes, 50 strokes, even 25 strokes and I kept going. Finally I made the 1/2 mile marker and wished the race was over but I had to keep on going. I did several 100 lap batches and at the 3/4 mark there were a lot of boats so the waves get large and difficult to manage (especially when you are tired from swimming for nearly an hour). But I just kept going. My friend Etsuko was my paddler and she helped encourage me and boost my spirits. When I finally saw the finish line I knew it was almost over. I had almost done it and I could feel the adrenaline sink in. I gave one more push and hit that buoy with conviction! Wahoo! So I am a finisher! My 11th race is done and it was an amazing experience. 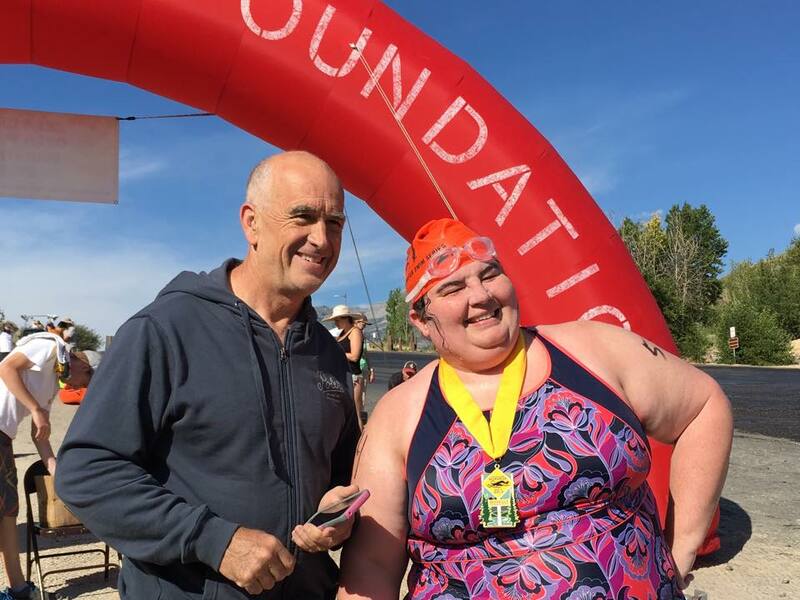 My Dad also finished which is an awesome accomplishment especially for someone who can’t swim freestyle. In the end, it was an amazing experience and I’m so proud of my medal. I know it is an Olympic medal and I was one of the last ones to finish our little race but it feels good to watch these Olympians and know I did something physically hard today too.